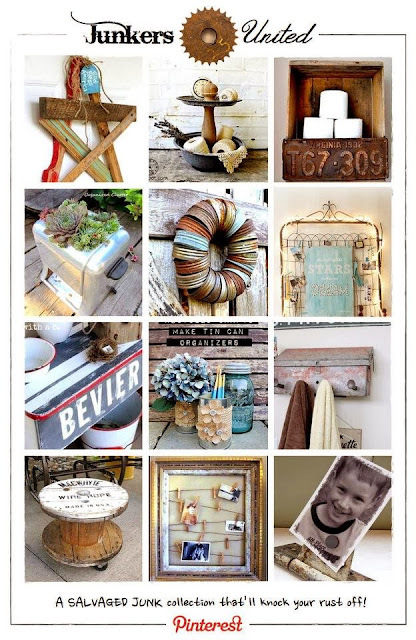 JUNKERS UNITED with a JUNK GALLERY WALL, a pin board and a link party! Welcome to Organized Clutter, and welcome to Junkers' United first round up! 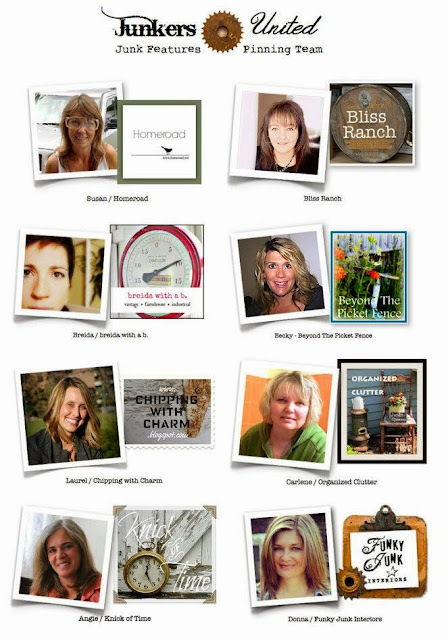 I jumped at the opportunity to join this team of talented DIY women, including our fearless leader, Funky Junk Donna. If you are new here, I call my blog, Organized Clutter, because my hobby is hunting for vintage bargains, and using them as home decor. To manage all of my collections, I need to be organized. I haven't always loved junk. When I was in my early 20's, and newly married, I wanted new stuff. I had had enough "second hand" stuff growing up. Owning junk to me back then meant you were poor. In my early 40's, I discovered the wonderful world of hunting for and collecting vintage items. Little by little, I began working more and more of my vintage collectibles into my decor. I loved a collected, unmatched, and interesting style. My first full fledged junk vignettes originated in my flower gardens. I had just read the book "Garden Junk" by Mary Randolph Carter, and I liked the idea of decorating my flower gardens. I started with galvanized watering cans, and soon collected old sprinklers, farm equipment, and galvanized tubs and buckets. I was a "Junk Gardener" for sure. Today my home is decorated inside and out, almost exclusively with vintage decor. My project for the Junkers group's first round up is creating a junk gallery wall over the sofa in my family room. I started out with a pair of colorful, vintage, chippy red and blue painted oars, that I purchased at a resort rummage sale. The oars were hung on a diagonal above the sofa. I then gathered together some shallow crates. Two were soda crates, one a raisin crate and one a greenhouse crate. The measurement from the top of the oars to about 8 inches above the sofa was 46 inches. Even though the crates were fairly shallow, I raised them high enough above the sofa to avoid taller people's heads from bumping or touching the crates. When I put together a wall display or gallery wall, I do not draw it out or hang brown paper. (I see these tips for gallery walls on Pinterest.) My walls never have many framed photos or prints like the Pinterest walls. My stuff is usually odd shaped, so I rely on laying it out on the floor, and moving it around on the floor until I get it right. I discovered that the "Beware of Unruly Dogs" sign, the green house crate, and the raisin crate positioned the long way, was very close to the 46 inches I needed from top to bottom. I hung these three items first, trying my best to get them even and level. I filled the raisin crate with three red thermoses from my collection. I love red. It adds life to the beat up crate shelves. The right side of my junk gallery wall came to together with a coke crate and an empty rustic frame, that I was thrilled to learn would work with a license plate. (This one is from the year and state of my birth.) Another lunch box, and more books fill the soda crate. I actually purchased the lock above the frame attached to the hinge. It was marked "lost key"! Another magnetic junk photo holder. A bolt with a clip on top. I am not even sure what it's for. Also miniature oil cans, and a folding metal ruler. A vintage photo of my parents is displayed with a magnet on the black lunch box. Another coke crate is hung on left side along with a vintage black lab tray. The crate was filled with a graniteware coffee pot, books, a clock, and a small red plaid thermos. Four small funnels (from my funnel collection) are lined up on top of the crate. A vintage padlock hangs above the dog tray. We had a wonderful black lab growing up. I love the breed. Now to fill in at the far left and right of the junk gallery wall! On the left, I hung a vintage ice fishing dipper and a door knob plate, and on the right a wooden masher with a red handle and an old pulley with chippy red paint. This old primitive, red chippy box was a recent purchase. It was originally priced at $32 but when I saw the price lowered to $20 with an additional 10% off for a moving sale, I couldn't pass it up at $18. That's my junk gallery wall! If you have been dreaming of a gallery wall or a junk gallery wall, I hope I have inspired you to give it a try! Click on above photo to visit Junkers United Pin Board. I had that very same plaid lunch box. And I think a dress to match that my mom made out of fabric from a shirt she sewed for my dad. So not cool back then! This is such a perfect example of junk not looking junky! I think people get worried if they use junk it will look too cluttered. This neat arrangement proves that theory wrong. You wall is absolutely junkaliciously gorgeous! I could stare at each old relic all day. There is nothing like looking at all the things you love when you glance up. Art? Who needs a painting when you can look at the real thing?! Truly love this, Carlene! Uh, Hi there.... you wouldn't notice if that red box and that red carpenter's level kind of.... went missing, right?? I am coveting some of your junk, Carlene!! Great wall decor. The bolt with the pin on the end of it was probably used to hold an implement to a tractor. 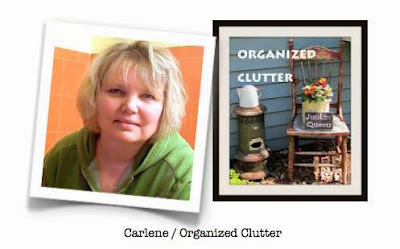 I think this is my favorite junk project you've created, Carlene! All that red plaid framed by the vintage boat oars....brilliant!!! Your family room looks so cozy and inviting. Well done! I just started a mini gallery wall with 3 items. It's a start, right? Carline--This looks like so much fun! One day I'll be back to my blog and will join in. . .Love your junk wall. It's gonna get pinned! Hi Carlene, I love how you pulled your funky junk gallery wall together! Much more me than photos. I love each and every thing! I have many of the same collections. I lay my wall décor out on the ground the same way. I am a visual person and have to see it. Congrats on being included with the wonderful ladies! Happy to be linking up! YOu have outdone yourself with this gallery wall! Best one I've ever seen girl! Love your wall! I especially like the lunch box...reminds me of my Dad. Oh WOW!... what a beautiful collection you've curated!... looks like something out of a magazine!... amazing work!